vooPlayer supports the privacy rights of its customers and their users. A major part of GDPR is the rights granted to EU residents in regards to their personal data. Under GDPR, a user has the right to access their data (in a commonly-used and machine-readable format) and the right to be forgotten (have all of their personal data erased), subject to certain conditions. 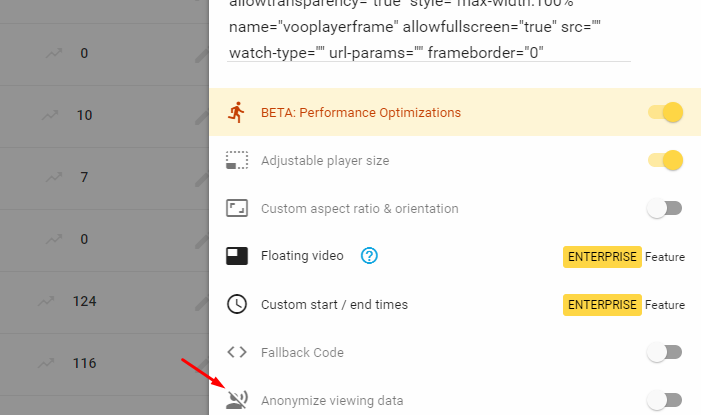 In the case of vooPlayer, once a visitor has provided their email address to you via one of our opt-in forms, we can show you which of your videos they've watched, what parts they watched, and when they watched them. All of this data is available for export and can also be deleted. We're are committed to serving any data requests within 30 days upon receipt. Email us at support@vooplayer.com your user's email address and instructions. _ga - Anonymized Google Analytics session ID. We've implemented a simple method allowing you to honor 'delete my data' requests by associated email or IP address. This option is now available in all viewer profiles. We've enhanced the email capture forms with an optional consent text and terms specifications as a second step process, requesting viewers to explicitly agree to stated details. This website uses vooPlayer (https://vooplayer.com) to power its videos. The vooPlayer platform tracks how you interact with the videos on this site: how much of a video you watch, at what points in a video you pause or rewind, etc. In some videos, we pause the video and request that you provide your email address or name. You are under no obligation to provide this information, but we reserve the right to limit certain videos to identified users. The vooPlayer platform aggregates the data collected through the videos here, including names and email addresses, and provides it to us. The vooPlayer platform does not sell or provide the data it collects to third parties. In the event of a data breach involving personal data (and ones that do not), we will contact you by email.